If so, brands should consider that older Americans had more difficulty than younger ones determining factual vs. opinion-based statements. 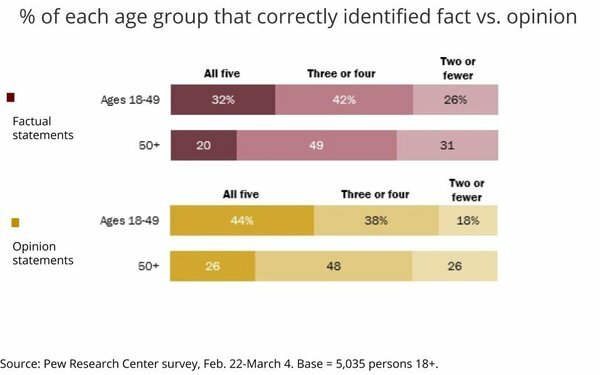 "About a third of 18- to 49-year-olds (32%) correctly identified all five of the factual statements as factual, compared with two-in-ten among those ages 50 and older," the study's authors noted, adding: "A similar pattern emerges for the opinion statements. Among 18- to 49-year-olds, 44% correctly identified all five opinion statements as opinions, compared with 26% among those ages 50 and older." 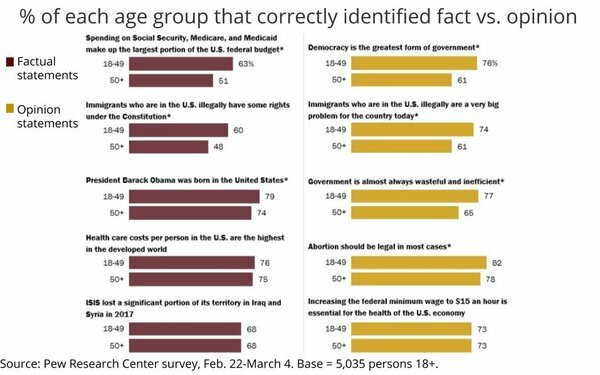 They conclude that younger Americans are not only better overall at correctly identifying fact from opinion based news, but they could also do so regardless of the idealogical appeal of the statements. If you're curious about your own fact vs. opinion prowess, you can take Pew's quiz here.